There are some stories that just defy comment. Try as I might, nothing comes to mind that adds to this story. Jim’s interest in automobiles comes through vividly in this letter. They had just lost the farm to the depression and were moving back east. It must have been quite the emotional and economic upheaval, but the focus of this letter seems to be on the 1930 Oldsmobile sedan and the drive to the East Coast. The bill of sale (photo below) for the farm auction is daunting. Everything from the farm was for sale, including fence posts and flour barrels. The farm itself, in the photo at right, looks a little bleak, nothing like what a farm in our times is, and certainly nothing like what Jim was headed to in Massachusetts. 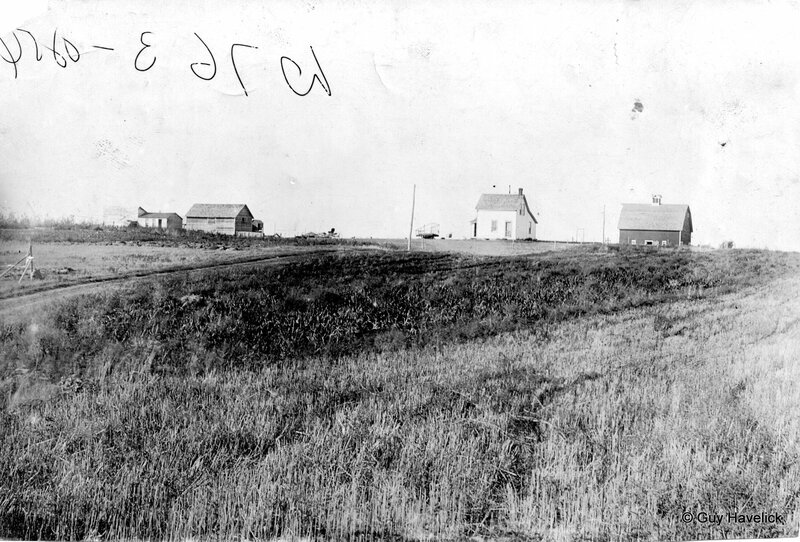 Below is a scan of the back side of the farm picture. It appears to be notes from the agent selling the farm or perhaps the bank. Can you decipher the handwriting? If you’re following these letters closely, you will notice that they aren’t necessarily in order. I’m not sure if that’s because I scrambled the stack or if Jim just wrote them as memories popped into his mind. One year at Christmas in the middle 1950s all the Luehr’s came to Grandma’s house for a “reunion.” I think there were a couple of these, with the last one somewhere in the 1980’s. 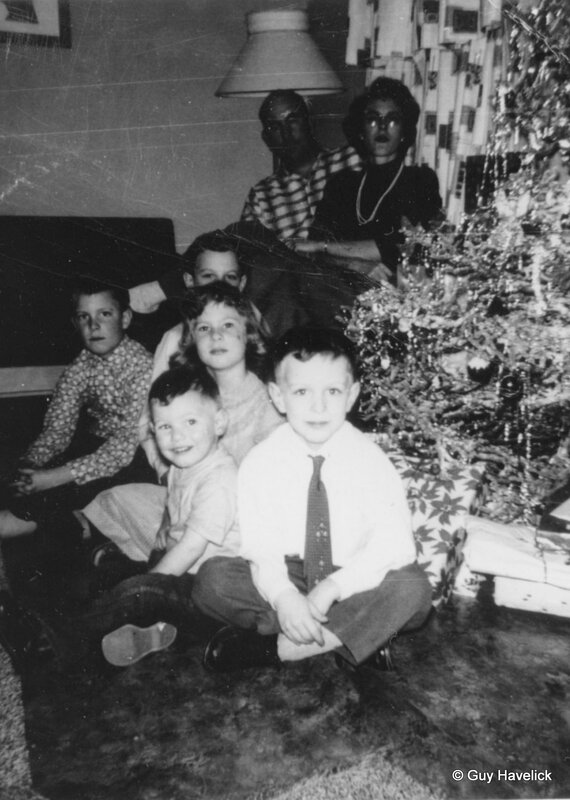 All the cousins, aunts and uncles came to Grandma’s house … the Pink House. The big thing that makes this Christmas memorable was that Santa showed up. Keep in mind that there were nearly a dozen kids in that little house. All of the kids were in the living room doing something, maybe watching TV or playing games. Who knows where the adults were. We didn’t care. Grace’s two brothers were masters of making something useful out of nothing. I got to know Henry quite well, as they lived in the next county over. To his dying day, Henry’s shop was home to some incredible projects made from other peoples’ cast-offs. Apparently, the tradition started early. There’s a lot more to say about Henry in future posts. Driving thru N D today, August 29, 1992 brings up memories of Henry & Melvin making hay for the cows. 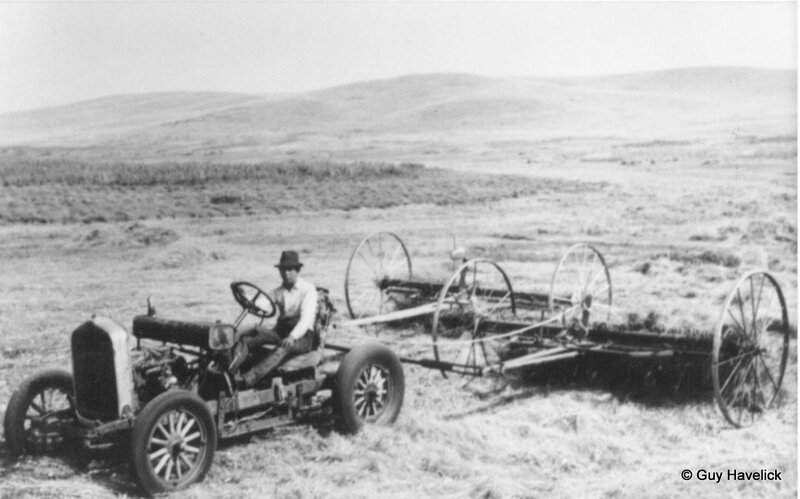 They used old car chassis to make jitneys to pull the hay rakes with. 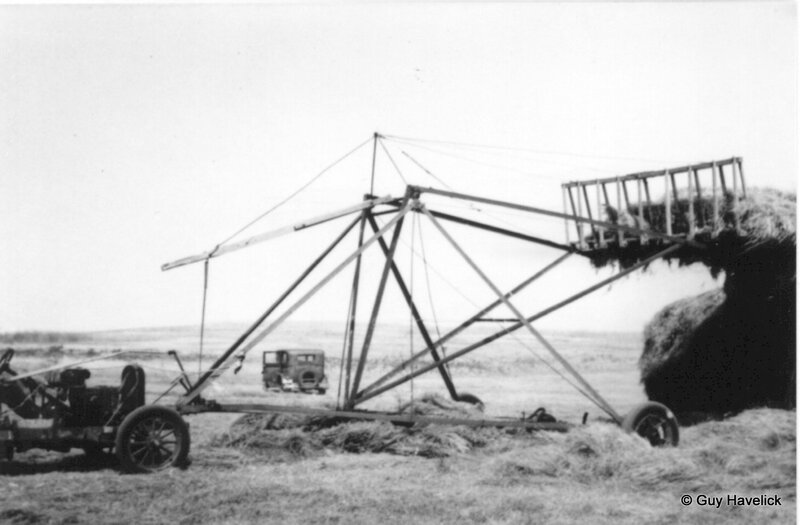 They also used them with the hay buckets to push the hay into piles and load the truck with. I think they mowed with the tractor. One year we got a nice new red Farmall tractor. One time when they were mowing in a meadow there was a lots of flame lilies growing + of course got mowed down so Mel brought home a couple buckets full. The tradition of the “Dime Store” is one that is firmly planted in my mind, too. The Woolworth store in Jamestown was an important part of my life for years. They sold everything, or so it seemed to this small town boy. They had clothes, gifts, a lunch counter, and even records. I have two distinct memories of the Jamestown Woolworth’s. One was the purchase of an LP, Freak Out, by the Mothers of Invention. Listening to their music now they seem quite tame, but compared to the Top 40 music that was playing on KSJB in those days, Frank Zappa was way out there. When I was about 10 years old my Dad bought a Ford Turing car. It was black and had to be cranked to start. Many people suffered broken arms trying to start them. About a half mile away from the Pink House, down fourth street, across the Pipestem Creek, in a cow pasture, was Cardboard Hill. Cardboard Hill is where we spent most of our time in the winter. Every kid in the neighborhood would make the rounds of Sears, Montgomery Wards, and Dodgson Appliance, looking for refrigerator or stove boxes. Lacking those, we’d accept just about any box large enough to break down and sit on. We’d haul those pieces of cardboard to the top of the snowy hill, pile on as many kids as would fit, then slide down the hill at top speed. No adults were anywhere near. The top of Cardboard Hill was about 70 feet above the flood plain. There was a short flat spot just before the huge (to a seven year old) drop-off into the river. That last steep part was probably only eight or ten feet, but that’s enough to get the heart racing. In summer the hill was just another cow pasture, but in winter after school or on a weekend afternoon it was alive with kids. Rail cars on the second street bridge, just downstream from the Pink House. Another of my favorite places to visit was the railroad. It was only a couple of blocks from our house. I’m told that even as a little boy (maybe four years old) Mom and Dad would occasionally find me sitting on the tracks in the rail yard, watching the switch engine build a train. Bill and Jim in July, 2006, reminiscing about the war. 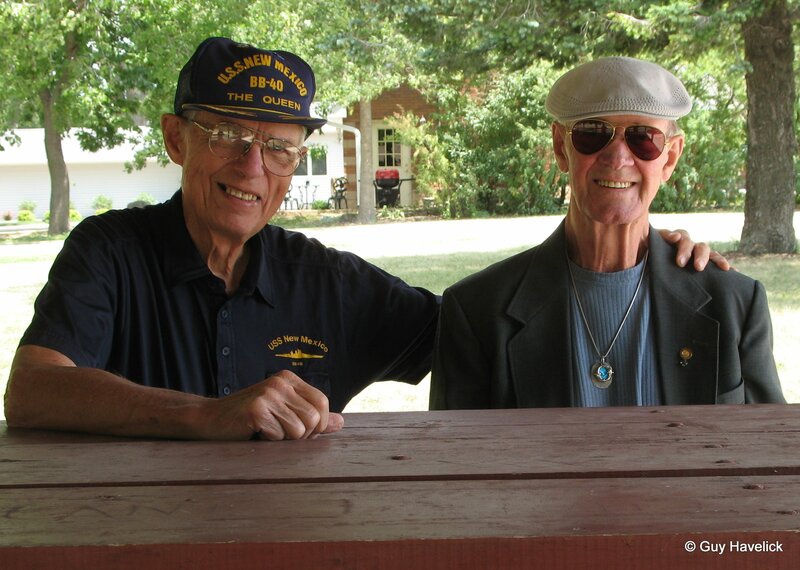 A couple of days ago I posted a letter from Jim about him volunteering for the Navy. He related that after Pearl Harbor he was assigned to the USS New Mexico (BB-40). From then he skips over the entire war, not telling us some of the most harrowing tales of the South Pacific. There are hints, but most of the stories are missing. He does mention that one of his duties was far below decks, handling the huge bags of gun powder. He told me what each bag weighed, and I wish I could remember, but it was close to a hundred pounds. Jim was a small man, and only seventeen at the time. There might have been as much gun powder as there was Jim! He was doing his job, far below decks, always in danger of explosion, in tropical heat. My claustrophobic self cannot, does not want, to imagine being in that hell hole. Fortunately, Jim was able to wrangle a promotion to the bridge working navigation. Beginning around the year 2000 Jim started visiting a war buddy of his in Clear Lake, Iowa. His name was Bill. They served together on the bridge of the New Mexico and had a lot of shared stories. The most dramatic was the one in the video below. There is more information about the attack on Wikipedia.